In 1960 Alfred Hitchcock took a step back from his glossy, big-budget color films to make a small horror film. Small budget, black and white and controversial Psycho was unleashed upon the world. Audiences were introduced to Norman Bates and his mother. They were mesmerized by the creepy house they lived in. And it made audiences so afraid to step into a shower it probably made water companies pretty upset. Psycho is undoubtedly a classic film. So what do you do with classic films? Well, you remake them years later of course! In 1998 Gus Van Sant had a more unique approach to doing a remake Psycho than expected. What if they remade the film as a shot-for-shot remake. Trying to adhere to as close to the original film as he could Van Sant went on to remake Psycho in what could possibly be one of the strangest remakes ever put on film. I check out Hitchcock’s original 1960 film Psycho starring Anthony Perkins, Janet Leigh, Martin Balsam, Vera Miles and John Gavin. Then take a look at Van Sant’s 1998 remake starring Vince Vaughn, Anne Heche, William H. Macy, Julianne Moore and Viggo Mortensen. The genius of Hitchcock's trailer (besides the wry humor) is that is NOT Janet Leigh in the shower. It's Vera Miles. So even in the trailer Hitchcock is engaging in misdirection. 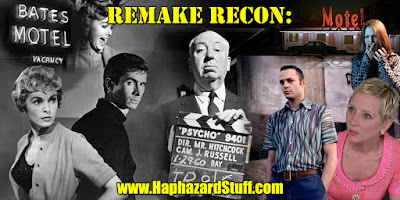 Psycho was going to be remade at Universal no matter what. Van Sant felt remaking Psycho was a bad idea, so he thought of what would be the least harmful way to do it or at least prove that remakes of great movies are a bad idea to begin with. I have to agree with him that this remake is 1) Harmless 2) Guaranteed to be the center of any discussion of remakes in film school 3) A way better option than have say "Rob Zombie's Psycho". You also didn't mention the one clever change they made. For Hitchcock's cameo they had Van Sant but also had a guy dressed like Hitchcock visibly chewing out Van Sant who is making a gesture like "I'm sorry! I'm sorry!". Just more evidence that Van Sant knew any remake of Psycho was a bad idea. Great to see another Remake Recon from you Hap! And this one is a doozy…I saw the 1998 remake in the theater and felt was embarrassing, awkward and genuinely nonsensical. To be honest, the only thing I remembered was (now Oscar-winner) Julianne Moore's inane line about her walkman; I would hate to blame Joseph Stefano for that as well as making Norman Bates a full-fledged pervert. You pointed out a lot of things I never would have even bothered to look for, such as how Arbogast gets out of his car, the logic behind the Christmas-December setting, etc. There's no question: the original is legendary and I do believe Anthony Perkins gave the finest performance by an actor in the entire 20th century (as far as actresses, my vote will always be Vivian Leigh in GWTW). In fact, while Hitchcock was nominated for an Oscar for Best Director he was reportedly very upset that Perkins wasn't even nominated and I don't blame the man. "I'm absolutely ashamed of your fellow actors," he told Perkins. My favorite trivia bit when it comes to PSYCHO is that letter to Hitchcock from an angry father who said his daughter refused to take a bath after seeing DIABOLIQUE, and now she refused to take a shower after seeing PSYCHO. Hitchcock just sent him a note saying, "Send her to the dry cleaners!" Oh and I remember how lame that PSYCHO bit at Universal was, even though seeing the entire park was fun. The best thing was I was able to go on the Back to the Future twelve times before permanently shutting down after two more weeks.